Monroe Gallery of Photography, 112 Don Gaspar, is pleased to present "People Get Ready", a major exhibition of 55 dramatic photographs from significant human rights struggles in history. The exhibition continues through September 23. We will be posting selected photographs from the exhibition here throughout the summer. 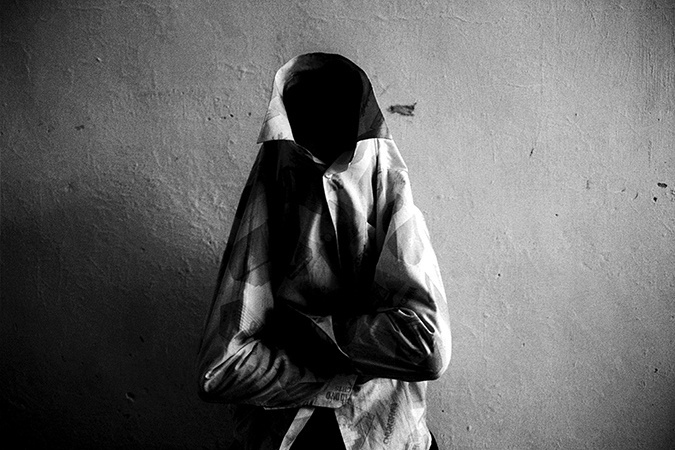 One view: "I became a photographer and not a person" ~ Photojournalism as Morally Troubling? Bill Eppridge, on photographing Robert F. Kenedy after being shot: In 1968 while five feet in front of his subject and friend, Robert F. Kennedy lay on the floor of the kitchen of Los Angeles's Ambassador Hotel, mortally wounded by a bullet fired by Sirhan B. Sirhan. Eppridge went into the crowd and began holding people back, but every once in a while, he would reach down and click his camera. 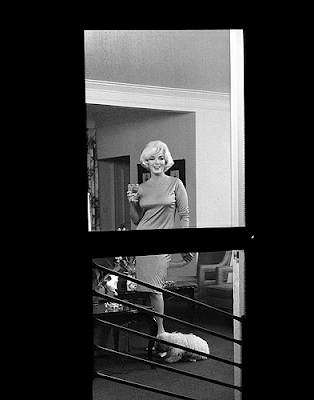 “Everything I saw and everything I heard, it's still there inside my head, like a slow-motion movie," photojournalist Bill Eppridge has said of that night—June 5, 1968, at the Ambassador Hotel in Los Angeles. “When the gunshots went off in that kitchen...I realized what it was. 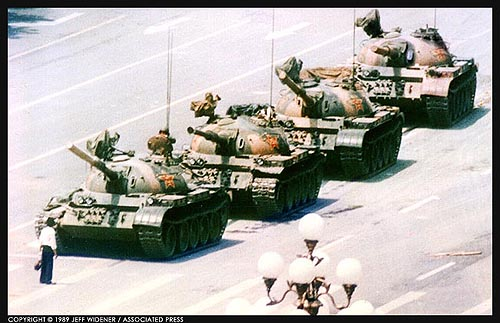 I had been in riots and wars and revolutions, and I knew the sound of gunfire, especially the sound of gunfire coming at me. There were eight shots, I counted them. It went through my mind not to take the picture, but this was history…I made three frames: the first one was totally out of focus; the second was in focus, it was pretty good, the busboy is looking down at him; and the third one, with the busboy looking up as if he were saying, 'Somebody help". Eddie Adams, on the Vietnam Execution photograph: 'I just followed the three of them as they walked towards us, making an occasional picture. When they were close - maybe five feet away - the soldiers stopped and backed away. I saw a man walk into my camera viewfinder from the left. He took a pistol out of his holster and raised it. I had no idea he would shoot. It was common to hold a pistol to the head of prisoners during questioning. So I prepared to make that picture - the threat, the interrogation. But it didn't happen. The man just pulled a pistol out of his holster, raised it to the VC's head and shot him in the temple. I made a picture at the same time. The prisoner fell to the pavement, blood gushing." "
Sunday, August 5 is the milestone 50th anniversary of her death -- yet Marilyn is probably as big a superstar today as ever. Like Elvis Presley and James Dean, she died before her fans were ready to let go of her. Marilyn Monroe's eternal beauty : "Marilyn Monroe may very well remain pop culture's reigning beauty queen into the next half-century." Collector marks the 50th anniversary of Marilyn Monroe’s death with a straightforward compilation of her songs, from the sultry big band jazz of “Diamonds Are a Girl’s Best Friend” to her sweetly wistful torch-gospel routine on 1954’s “River of No Return”. 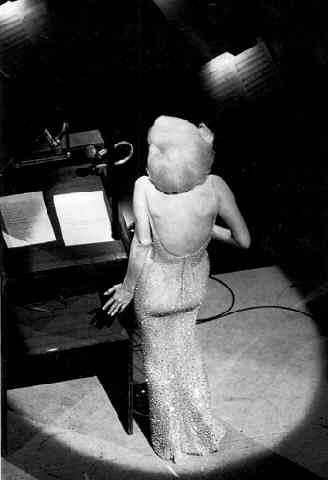 Bill Ray remembers the evening Marilyn sang "Happy Birthday" to President John F. Kennedy. On January 1, 1892; Annie Moore, a 15 year-old Irish girl, accompanied by her two brothers entered history and a new country as she was the very first immigrant to be processed at Ellis Island. Over the next 62 years, more than 12 million immigrants were to follow through this port of entry. "It is a dangerous time to be a journalist"
Committe to Protect Journalists' Deputy Director Robert Mahoney testified before the Tom Lantos Human Rights Commission in Washington on Wednesday, highlighting global attacks on press freedom and, in particular, assaults on the press in Honduras, Russia, and Turkey. In the past year, more than a quarter of the 57 journalists who fled their homes came from East Africa, reinforcing a trend from previous years, CPJ researchshows. This has resulted in a journalist refugee crisis in East Africa that has drastically affected the region's ability to maintain media institutions that provide reliable, vital information. After enduring violence and threats, these journalists fled abroad, only to land in a state of prolonged uncertainty as governments and the U.N. refugee agency process their cases. 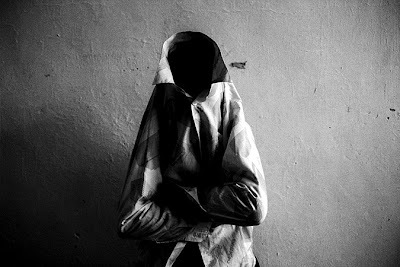 During the past five years, the greatest number of journalists fled violence in Somalia, where six journalists have been killedin 2012 and no journalist murdershave been prosecuted since 1992. Eritrea and Ethiopia, East Africa's worst jailers of journalists, also lost many to exile. Journalists also sought refuge from targeted attacks and threats in conflict-ridden Syria and Pakistan. Estemirova was a frequent contributor to the independent Moscow newspaper Novaya Gazeta and the Caucasus news website Kavkazsky Uzel. She was also an advocate for the Moscow-based human rights group Memorial and a consultant for the New York-based international rights group Human Rights Watch (HRW). She was the fifth Novaya Gazetajournalist killed since 2000. Estemirova's colleagues told CPJ that her relentless reporting on human rights violations committed by federal and regional authorities in Chechnya put her at odds with regional officials. Şık, a prominent reporter who had written for the dailies Cumhuriyet and Radikaland the weekly Nokta, was charged with aiding the Ergenekon conspiracy, an alleged nationalist military plot to overthrow the government. MONTGOMERY, Ala. (AP) -- Thelma McWilliams Glass, a longtime professor and civil rights pioneer who helped organize the Montgomery bus boycott, died on Wednesday. She was 96. "The ASU family lost one of its crown jewels today," said President William H. Harris. "Mrs. Glass was the consummate educator, whose life was a shining example of service, courage and commitment. She will be truly missed." The boycott by blacks in the city crippled the bus service and helped bring an end to segregation of public transportation in the South a year later. Glass was secretary of the Women's Political Council, a group that spread the word through the black community in Montgomery about the boycott. "The men talked about it, you know, but we were ready to take action," Glass said during a recent interview with ASU Today Magazine. Glass has an auditorium named after her in Trenholm Hall at Alabama State University - her alma mater. The university honored Glass with the Black and Gold Standard Award during the 2011 Founders' Day Convocation. "...evidence that police made violent late-night raids on peaceful encampments, obstructed independent legal monitors and was opaque about its policies"
"Obstruction of press freedoms and independent legal monitoring, including arrests of at least 10 journalists, and multiple cases of preventing journalists from reporting on protests or barring and evicting them from specific sites." Previous coverage: Freedom of the Press? Read the full post with comments here. W. M. Hunt in Santa Fe: “The Unseen Eye: A Life in Photographs and other digressions ... "
Not necessarily by popular demand but at his own insistence, W.M. – Bill – Hunt will recreate his unique performance piece suggested by the text for his book, “The Unseen Eye: Photographs from the Unconscious” (Aperture 2011). Hunt debuted "A Life in Photographs and other digressions ...” last October when the book was launched. “The Unseen Eye: A Life in Photographs and other digressions ... "
Special performance by W.M. Hunt on Thursday, July 26, 2012 at 6 PM, at Tipton Hall, Marion Center for Photographic Arts at Santa Fe University of Art & Design, 1600 St. Michael’s Drive, Santa Fe, NM. This is a monologue with video suggested by the text for my book, “The Unseen Eye: Photographs from the Unconscious” (Aperture 2011). It’s rude and sweet and funny. It lasts a little over n hour and will be followed by refreshments and a book signing. "in 2011, the NYPD stopped someone every 45 seconds"
"I was in the Bronx on another project and I didn’t have my camera out. I saw a man riding a bicycle and a cop stopped him in the middle of the street. He stayed on his bicycle and he just immediately put his arms out in the air, like he knew precisely what position to assume. That’s a whole other thing that interests me; how body language for some people according to their race is a normalized gesture. 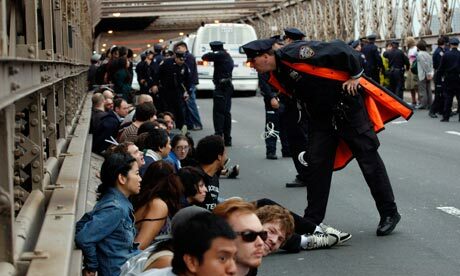 For white people gestures [associated with Stop & Frisk] would be abnormal gestures. Last summer, I saw a guy – he looked like he was 17 or 18 years old – in the Bronx and two plain-clothed cops came out and pushed him against a wall and stripped him of everything. It was intense." Kim Jeong-Ya (a pseudonym), 67, lives in China near the North Korean border and belongs to a handful of Chinese human rights activists who dedicate their lives to help both North Korean defectors and abducted South Koreans make a safe passage from North Korea to South Korea via mainland China. 2013 will mark a milestone for the Open Society Foundations’ Moving Walls exhibition. 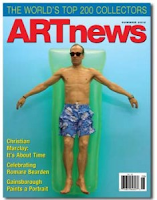 It will not only be our 20th exhibition since starting in 1998 but will be the inaugural exhibition at the Foundations’ new headquarters at the Argonaut building on 57th and Broadway in New York City. Moving Walls is a documentary photography exhibition produced by the Open Society Foundations that features in-depth explorations of human rights and social issues. These images provide human rights evidence, put faces onto a conflict, document the struggles and defiance of marginalized people, reframe how issues are discussed publicly, and provide opportunities for reflection and discussion. Since 1998, Moving Walls has featured over 150 photographers. In contrast to our current location, the new exhibition space will be located on the street level in a public conference space. That, combined with being more centrally located on 57th Street, gives us opportunities to engage with the public in a different way. The current office has been a great home to Moving Walls but I am excited for the new possibilities. Stay tuned for more information as we get closer to the opening of the exhibition. "He came to me one day and said, 'I got a wonderful black man. His name is Booker Wright. And he's a waiter at Lusco's Restaurant. And what he does, is a minstrel scene. He does a singsong of the menu. And that's the only menu they have. People wanna know the menu, they get, 'Booker, go tell 'em.' And he'll sing them the song of the menu. And it's absolutely delightful.'" "Now that's what my customers, I say my customers are expecting from me," he began. "Some people nice. Some is not. Some call me Booker. Some call me John. Some call me Jim. Some call me @!$%#! All of that hurts but you have to smile. The meaner the man be the more you have to smile, even though your're crying on the inside. "You're wondering what else can I do. Sometimes he'll tip you, sometimes he'll say, ‘I'm not gonna tip that @!$%#, he don't look for no tip.’ I say, 'Yes sir, thank you.' I'm trying to make a living." For nearly two minutes, Booker Wright, spoke straight to the camera, and straight from the heart. "Night after night I lay down and I dream about what I had to go through with. I don't want my children to have to go through with that. I want them to get the job they feel qualified. That's what I'm struggling for," Booker concluded. "I went there to photograph a minstrel show," Frank says, "And I stayed there to hear a man talking about his life and what his dreams are. And it was so moving." 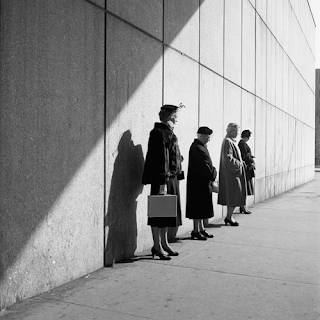 Among eccentric photographers of the 20th century, Vivian Maier stands out for her self-effacing reclusiveness. For much her life she worked as a nanny, and the tens of thousands of images she made remained unknown until a Chicago real-estate agent and amateur historian discovered them in 2007, less than two years before her death. Maier’s black and-white photos mostly depict street life in Chicago and New York, and bear comparison with the works of Helen Levitt, though Maier’s eye was more wide-ranging and her approach occasionally experimental, as when she ventured into pure abstraction in a manner reminiscent of Aaron Siskind. This show of images from the 1950s through the early ’70s offered a generous introduction to her remarkable output. Like Levitt, Maier had an affection for children, capturing a small boy with one leg thrust forward, holding tight to a man, presumably his father, who adjusts the boy’s shoe. And like Weegee, she sometimes shot the seamier side of urban life, as in a photo of two men dragging another man down the street (Christmas Eve, 1953). But she was equally alert to the glamour of the city, paying homage to beautiful women in elegant hats and opulent furs. Some of the works here offered startlingly dramatic viewpoints: a man and woman, shot from above, hold hands across a restaurant table; a quartet of older women, pinned in a trapezoid of light, wait against a wall like characters in a Beckett play (1954, New York). Maier’s humorous side surfaced in an untitled image of a ragtag couple, the man standing on his head, in front of a poster for a strip joint. In another, Arbus-like shot, two men—one of them a stooping giant—inspect the goods in a shop window as a pair of curious women gape in amazement. The show ended with a self-portrait of Maier, smiling wistfully, captured in the reflection of a mirror being unloaded in front of a drab apartment complex—as unassuming in art as she was in life. "A raised arm, black power and Olympic trauma"
The veteran sprinter is reminiscing about just what it feels like to go to the blocks in an Olympic final. He makes it sound like a dead man's walk. It is certainly traumatic, it is certainly traumatic," the sprinter repeats the phrase. "You know, looking around, walking in a stadium is an experience that only those in the field can feel. You work all these years competing against some of the best people in the world and then you get to the final race. It goes beyond human imagination to the point where you forget where you are and you go back to your childhood, thinking 'how did I get here?' You look around at these world-class athletes and if you're not very careful, you can lose your race before you start by thinking everybody else is better than you are and what are you doing here?" Whatever the state of his nerves, the sprinter in question ran an immaculate race. He whipped past the finishing line of the 200 metres final at the Mexico Olympics in 1968 in an astonishing time of 19.83 seconds. Tommie Smith was 24 at the time, younger than Jamaican champion sprinter Usain Bolt is now. "Aged 24, my speed and Usain Bolt's speed were about the same," Smith says today. The assumption was that he would get even faster. However, when he and third-placed fellow African-American athlete John Carlos went to the podium, they raised their fists in a Black Power salute. The gesture caused outrage at the International Olympic Committee, which dubbed it a "violent breach" of the Olympic spirit. 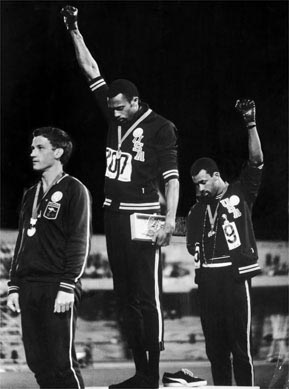 Smith and Carlos were vilified, as was the white Australian silver medallist Peter Norman (who supported their gesture.) The story of the friendship between the three men is told in the documentary Salute, shortly to be released in the UK. "He [Norman] was a man of his word and a man of honesty." Smith pays tribute to the Australian sprinter. "He believed in rights for all men. He was a true friend and he went through some of the same things that Carlos and I did," Smith remembers of how all three men suffered because of their gesture in support of human rights. Norman didn't raise an arm but he wore an "Olympic Project For Human Rights Badge" –itself a defiant act – and he suggested that Carlos should wear Smith's left glove. As a result, he was ostracised by the Australian media and the country's Olympic selectors, who never picked him again. After Mexico 1968, Smith's own Olympic career was over. If he is bitter about the way he was treated by the Olympic movement, he is not showing it. He relishes the friendships that the Olympics can help foster between athletes all over the world. However, he has no illusions about the machinations that go behind the scenes whenever the Games are staged. "The politics of it is a different story. Those who contend that there are no politics in the Olympic Games are speaking with false tongues." 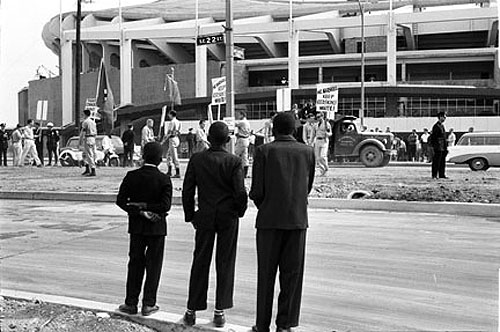 Ask him today if he has mixed feelings about that moment in 1968 when his salute effectively ended his athletics career and he replies: "I regret the fact that I had to do that to bring out the truth about a country that didn't honour the rights of its constitution." No, he says today, he didn't know that making the Black Power salute was going to curtail his athletics career. "But had I known, it wouldn't have made any difference," he insists. Would he have won more Olympic medals? He ponders the question. "I certainly would have run. I don't know if I would have been the fastest – but whoever was ahead of me would have been in trouble!" Though now almost forgotten, the case of “the Chickens and the Bulls” as the NYPD called it (or “Operation Homex,” to the FBI), still stands as the most far-flung, most organized, and most brazen example of homosexual extortion in the nation’s history. 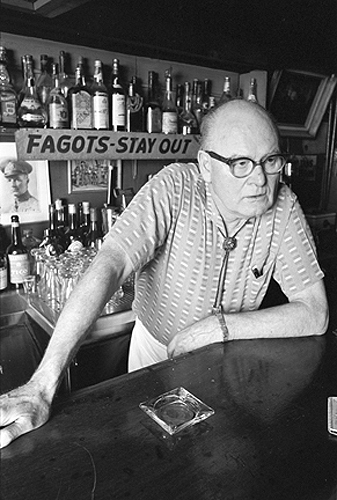 And while the Stonewall riot in June 1969 is considered by many to be the pivotal moment in gay civil rights, this case represents an important crux too, marking the first time that the law enforcement establishment actually worked on behalf of victimized gay men, instead of locking them up or shrugging." "With the case, the U.S. government appears to be asserting that linking to copyright infringing files under any circumstances should not only be an offence but an extraditable offence, and that the U.S. government is fully prepared to reach into other countries and extradite their citizens when there is virtually no connection whatsoever between that person’s acts and U.S. law or jurisdiction." You’re Invited to VIP PHOTO! Start Collecting on July 12. Opens at 8:00am EST. 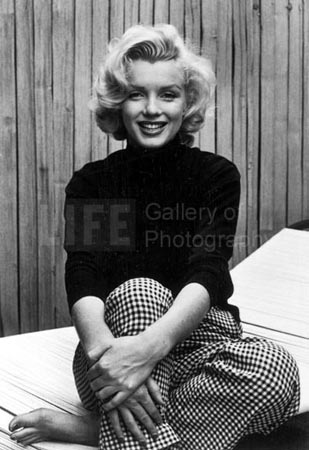 Monroe Gallery of Photography invites you to discover hundreds of photographs from over thirty international galleries. Be the first to view this innovative event where you can browse, share and collect fine photography, exclusively online. Registering ensures you receive exclusive offers from VIP, newly available work, and news about upcoming events! In 1977, a 24-year-old woman took a job as caretaker for an elderly artist in one of New Mexico’s remote villages. The woman was Margaret Wood; the artist was Georgia O’Keeffe, and their pairing would launch an adventure into food and friendship that would last a lifetime. Wood was living in Lincoln, Neb., when she received a call from an acquaintance about a job opening in Abiquiu. Wood had graduated from Nebraska’s Hastings College with a degree in art education. O’Keeffe was 90 at the time, and her eyesight was failing. She needed someone to stay with her throughout the night and to prepare simple meals. 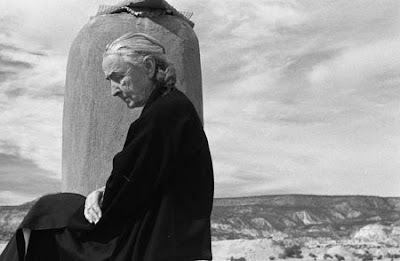 Wood’s duties included brushing O’Keeffe’s long white hair, using just the right pressure, reading to her and accompanying her on her walks beneath the red cliffs of Ghost Ranch or down her sweeping Abiquiu driveway. Wood recalls her five years with the great artist in “Remembering Miss O’Keeffe: Stories from Abiquiu” ($19.95, Museum of New Mexico Press). Wood will talk about her time with O’Keeffe and sign books at Collected Works, 202 Galisteo St., No. A, at 6 p.m. Tuesday. “I knew someone who had been a companion for Georgia O’Keeffe, and she was looking for someone to take her place,” said Wood, now living in Santa Fe and working as a speech therapist. “Her (O’Keeffe’s) eyesight was failing due to macular degeneration. Her friend warned her of O’Keeffe’s exactitude; everything had to be to her specifications. She cautioned Wood to be patient. Wood rented a former schoolhouse in the small village of Barranco. She thought she knew how to cook, but she quickly learned otherwise. O’Keeffe took great pride in her healthy lifestyle. Whole wheat flour was always ground fresh with the artist’s personal mill. Yogurt was homemade, often from the milk of local goats. Fresh herbs, fruits and vegetables came from the artist’s garden. “I tried to fit in what she needed,” Wood said. “It took me several months to make friends with her. She was such a private person and an independent person that it was an invasion to have someone assist her in this way. Freshly made beds had to be perfectly tucked in. Food had to be attractively arranged on the plate. Wood worked from 5 p.m. to 8:30 a.m., while the rest of the staff went home. O’Keeffe was a fan of Bach, Schubert and Monteverdi. She liked Wood to read to her — mostly Prevention, Time and Newsweek magazines, the bold print version of the New York Times and art books. But no rock and roll. Despite her carefully cultivated image as a recluse, O’Keeffe regularly welcomed visitors. Wood was thrilled when singer-songwriter Joni Mitchell came calling, resplendent in gold eyeshadow. Allen Ginsberg arrived with his partner Peter Orlovsky. They admired the late afternoon light as they compared the nature of words to action. O’Keeffe declared that talk was easy but it was action that got things going. Ginsberg countered that words often inspired people to action. He and Orlovsky climbed the ladder to the roof to watch the sunset. O’Keeffe often talked about her late husband, the photographer and impresario Alfred Stieglitz. “She talked about how people thought he liked the arts page, but he (really) liked the sports page because of the horse races. Sometimes, O’Keeffe’s traditional ways clashed with the changing times — especially the women’s movement. Wood felt like she was in a time warp. She left to pursue graduate school. She visited O’Keeffe after Juan Hamilton, her companion, had moved her to Santa Fe for 24-hour care. But on her second visit, Hamilton warned her that the artist’s memory was fading. O’Keeffe did not recognize her. Wood was stunned, then felt waves of grief. She stopped going but still dreamed about the artist. Today, Wood finds a direct link between her profession and her years spent with the great artist. But mostly, she remembers the food. If you go WHAT: “Remembering Miss O’Keeffe: Stories from Abiquiu” by Margaret Wood. A conversation and book signing with the author and Miriam Sagan. Gayle Tzemach Lemmon’s riveting book, The Dressmaker of Khair Khana, follows the true story of Kamila Sidiqui, an extraordinarily determined young female entrepreneur living under the restrictive and punishing rule of the Taliban in Kabul after the civil war. By picking up a needle and thread and establishing a clandestine sewing business, Kamila, other female members of her family and neighbors managed to earn income to feed themselves and survive under impossible conditions for women. From reporting Kamila’s inspirational story, Ms. Lemmon has become a major voice to encourage financial institutions and governments to support female entrepreneurship in order to rebuild society in conflict and post-conflict regions around the world. She is Contributing Editor At Large for Newsweek Magazine and the Daily Beast, and the deputy director of the Council on Foreign Relation’s Women and Foreign Policy program. She will be joined by Market participant and entrepreneur Rangina Hamidi and Gene Grant, host of PBS New Mexico in Focus. Other tickets are priced at $35 for preferred seating, $25 general seating, and $15 balcony seating. 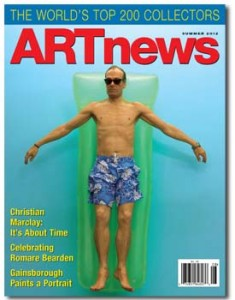 Full schedule of 2012 Santa Fe International Fold Art Market here. Kandahar Treasures, is giving financial freedom to women who do the traditional geometric embroidery unique to the area. Started by Rangina Hamidi, an Afghan whose family fled war to the United States when she was a child, the project now has more than 400 women selling products. Some of the women earn up to $100 a month, which is almost double the average government salary. Homes with mothers and daughters participating have dramatically improved their family’s economic standing, and given women more control over their lives. The Santa Fe International Folk Art Market is a results-oriented entrepreneurial 501(c)3 nonprofit organization that provides a venue for master traditional artists to display, demonstrate and sell their work. By providing opportunities for folk artists to succeed in the global marketplace, the Market creates economic empowerment and improves the quality of life in communities where folk artists live. It is now the largest international folk art market in the world, and its success led to Santa Fe’s designation as a UNESCO City of Folk Art, the first U.S. city named to UNESCO’s prestigious Creative Cities Network. Exercise your freedom and come witness 55 powerful photographs from significant human rights struggles in history. Reception 5-7 pm Friday, July 6. 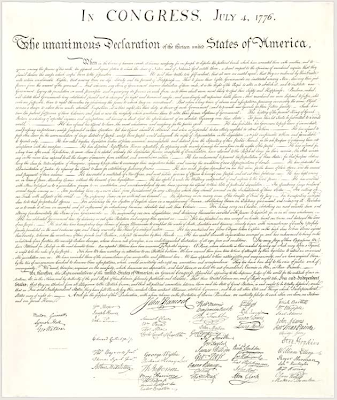 On July 8, 1776, the first public readings of the Declaration were held in Philadelphia's Independence Square to the ringing of bells and band music. One year later, on July 4, 1777, Philadelphia marked Independence Day by adjourning Congress and celebrating with bonfires, bells and fireworks. 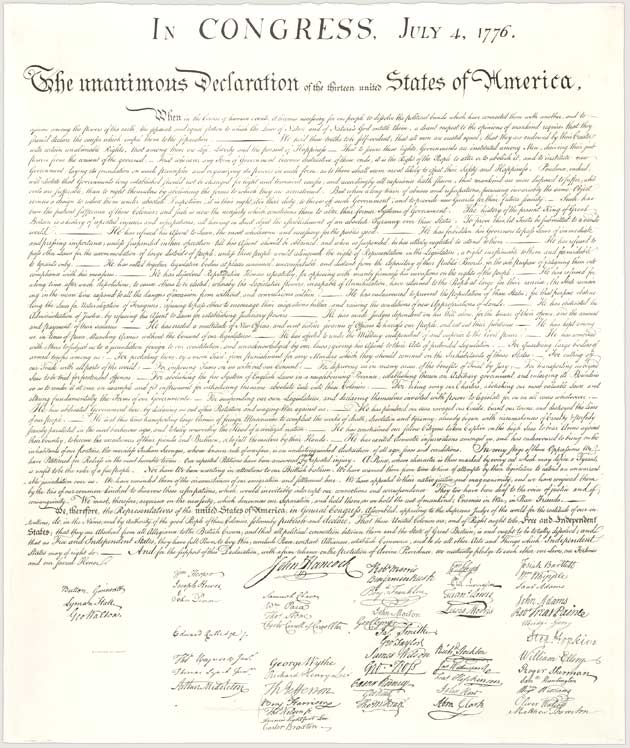 Congress established Independence Day as a holiday in 1870, and in 1938 Congress reaffirmed it as a holiday, but with full pay for federal employees. But that's the dreadful truth at the heart of today's world press freedom fight. It's sliding backwards, getting worse year by year. Democracy, on the evidence of the world's weightiest human rights rapporteurs here assembled, is sinking, not swimming. And you can't merely measure such things by the thump of a car bomb or the clank of a prison door. Try looking much closer to home – at Romania or Bulgaria, in the EU, starting to slip towards seedy repression; at Hungary, driving Brussels to outright alarm." “I have always been fascinated by the way the city’s energy ebbs and flows from morning to night,” Wilkes told The Daily. Wilkes just completed his first international piece of the same effect in Shanghai, and plans to shoot in Los Angeles, Chicago, Europe and Jerusalem. Visit his website for more images.